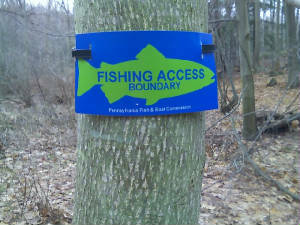 Harrisburg, PA – Anglers visiting Upper and Lower Hereford Manor Lakes in Beaver County can enjoy a special “Opening Day” on Saturday, March 5, and fish for stocked trout one last time before the lakes are drawn down in spring in anticipation of breaching the dams. Mr. Arway emphasized that the stocking will depend on the weather. If the lakes are still frozen on March 5, the PFBC will stock them once the ice melts. If the lakes can be stocked on March 5, the creel limit and minimum size limit for trout will be 5 fish per day and 7 inches, respectively. Last Nov. 1, the PFBC lifted all seasons, sizes and creel limits in preparation of the complete drawdown of the lakes and breaching of the dams. These regulations remain in place with the exception of the trout creel and size limits. Removing all harvest restrictions provides additional recreational opportunities for anglers and can help reduce the number of fish that could potentially be stranded when the water level drops. Once the draining of the lakes begins, which is expected to be in late April or early May, all public access to the lakes will be prohibited. At that time, the PFBC will attempt to salvage as many game fish as possible from the lakes and relocate them to other waters in the area. The dates of the fish salvage will be announced once they are set. The Hereford Manor Lakes are popular fishing and boating impoundments located in Franklin Township, Beaver County. The dams were constructed prior to 1958 in conjunction with strip mining operations and were acquired by the PFBC in 1973. The Pennsylvania Department of Environmental Protection’s Division of Dam Safety has declared both dams as “high hazard, structurally deficient” structures which must be rebuilt. Breaching the dams is the first phase of the project and is expected to be completed by November.